American Water Heaters is a leading manufacturer of residential water heaters. Our Builder's Program is designed to help you with information and incentives if you are building 10 new homes or 10,000. For more details about our program Contact Us today! 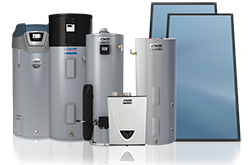 We offer today's most comprehensive line of water heaters featuring innovative gas, electric, hybrid, and tankless technologies. Find out which of our water heaters is the perfect match for your next project. Select a Product category to see our full line of residential heaters.